However, sadly the insurance company had refused to pay compensation for the machine. I spoke to him little while ago and suggested to him that we would like to start a “Fund Him” campaign on social media, for which he politely declined to receive anything as “Donation” but would be delighted if someone or some institute can lend him Rs 1.5 million right now, so he can pay his previous loan areas straightaway and get his name out of the CRIB. His compounded loss due to damage to the machine, loss of business etc run up to Rs 7 million but he was confident that he could make his business flourish again if his initial difficulty of finding Rs 1.5 million and get his name out of CRIB soon. Also please note that he has to still take care of his injured worker, despite his own difficulties and the worker is responding well to the treatments and recuperating. Share as much as possible and see if anyone can lend his the initially required funds to restart his business. It is Ceylinco General Insurance but you can't blame them as it was not covered under such circumstances. (However, if I was the Manager, I would have sanctioned considering the human side of the story). I was trying to create a Go Fund Him page online but without much luck. Cannot ignore replying to this post when a good person is in difficulty after doing a good deed. I repped you too for raising this matter. Good people like him needs to be rewarded while cunning game players and indecent should be looked down upon. but he will be financially rewarded by society / companies. getting around $20000 in return. 1) If you can start a Gofundme page , I will spread the word. 2) But starting Go fund me for Sri Lanka will be highly scrutinized by GFM. India/Sri Lanka and most Asian countries do not have a good reputation on charity matters , honestly and transparency. It may not get approved without proof. Gofundme keep a cut too. ii) If you/he can tell this story to media channel who has a charity program, his needs can surely be easily met. iii) Can't he approach a Bank and get loan against his assets( building) ? Of course no bank in SL will give loan against the humane service he did . iv) If he has facebook page tell him to post his story on FB. I am almost positive it will go viral with offers to help if he tell his story. 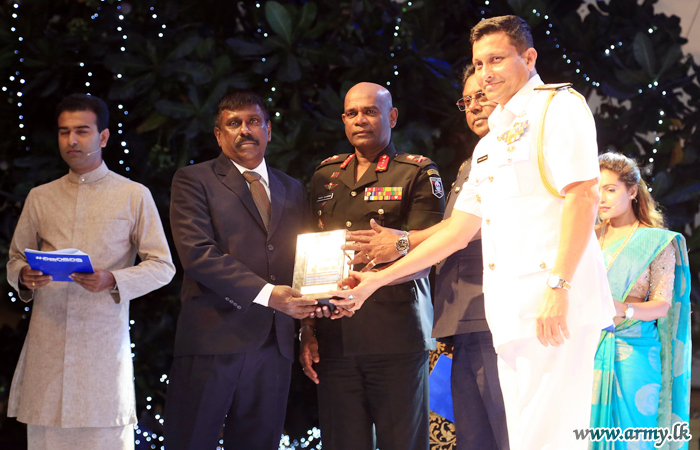 The Sri Lanka Army felicitated him. Tried to create a Go Fund page for him but I could not get it done due to Paypal is not allowed here. I have posted it on many places and spoken to a few rich people as well. Hopefully, something good will come his way eventually. My only supplication to all those who read this is to give as much publicity as possible in your own little ways. I will speak to him again soon and post an update accordingly. Excellent job Kith,respect you.It's great to see still people with a heart is living.I'll spread the message as far as I can. Have lost faith and interest spending time here but regarding this post / Mr Meththananda have not. Bad things often happen to people like him. So very sad. My life experiences too relate to this. So I ventured to find out more about his situation . 1) He was doing very good business with this destroyed machine and has won many awards including the best entrepreneur in his region. Machine was worth about Rs 100 Laks. He has taken a Loan from a Private bank to buy the Machine. Now he is unable to pay the balance monthly installments. Bank is not reorganizing the loan giving him more time to pay. No installment or interest payment relief given. Simply the dirty Bank brutally wants their money. They are now trying to auction off his private assets to recover money. He apparently has taken 3 Insurance policies. b) One he missed payment, so its inactive. c) Third , he insured his Workers. But the Insurance company instead of insuring against "Worker Designations" has insured with worker names. This particular worker who was injured , not amazingly wasn't included by the insurance company in the policy name list. So summary : no insurance payment for the worker. incident comes , where are the people and humane qualities left in this brutal country from Businesses to Ordinary citizens ? b) is there a legal claim/ loophole from his side with the Insurance company to get them to pay ( Policy c) or it is dead cause to fight against them ? If you need a Paypal account for GoFundme I maybe able to arrange one. a) Gofundme keeps a cut. Money collected will be lesser than projected. Think it maybe be better to find a local solution. I have a valid Paypal account but on this occasion, I was unable to get access to it through GoFundMe site. Tried a few times with no luck. I was planning to call him up again and get an update. If he has changed his mind, then I will start something for him. Thanks for the support (@ SLS). (Something I see here often and I blame it to our old education system and that is many are unaware what to cover and what not to when taking up an Insurance cover and or Bank loan). Excellent work Kith and thanks SLS for his guidance and appreciation for this worthy course.